No, whales absolutely do not live in your local school pond, lake or bath! BUT... in a pond there is plankton (tiny floating animals and plant-like organisms) which you can discover with a good magnifying glass or under a microscope. The biggest living beings on the planet, blue whales, also live on a type of plankton called krill. 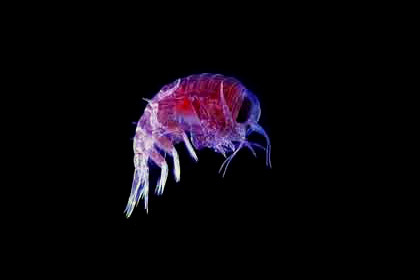 Krill appears in huge amounts in certain sea regions. Take a water test from a pond and discover whats in there with a magnifying glass or microscope. With an identification book you can find out which plants or animals you have. Perhaps your teacher could help. A blue whale weighs up to 120 metric tons and has a big appetite. He can consume up to 4 metric tons of plankton (about 4 million creatures) a day! Ask your teacher or look in a biology book to find out about food chains. Click here to see our feeding frenzy experiment and to download a food chain mobile to colour and create.